The 2016 Kohler Grand Prix was the first major AOWR event to be held at Road America since the Champ Car Generac Grand Prix of Road America, in August 2007. With the exception of 2005, when the race was dropped due to sponsorship issues, it was a perennial event on the CART/Champ Car calendar from 1982 - 2007, with Héctor Rebaque winning the Road America 200 in 1982, for Forsythe Racing, in a March 82C-Ford Cosworth DFX and Sébastien Bourdais, winning the Champ Car Generac Grand Prix of Road America, for Newman/Haas/Lanigan Racing, in a Panoz DP-01-Cosworth XFE, in 2007. With the merger of Champ Car and the IRL in 2008, the race was dropped from the calendar. The very first race to be held at Elkhart Lake was in 1950 and organized by the Chicago Region and Milwaukee Region of The Sports Car Club of America. It was the first of three races from 1950 - 1952, which were held on courses layed out on public roads. However, after a fatal accident at Watkins Glen in 1952, it was decided to discontinue motor racing on all public roads and the event was moved to a private, purpose built course. Highway engineer Clif Tufte, got together with local citizens and the Chicago Region of the Sports Car Club of America to develop and build a permanent racecourse. On September 10, 1955, Road America held its first SCCA national race weekend. 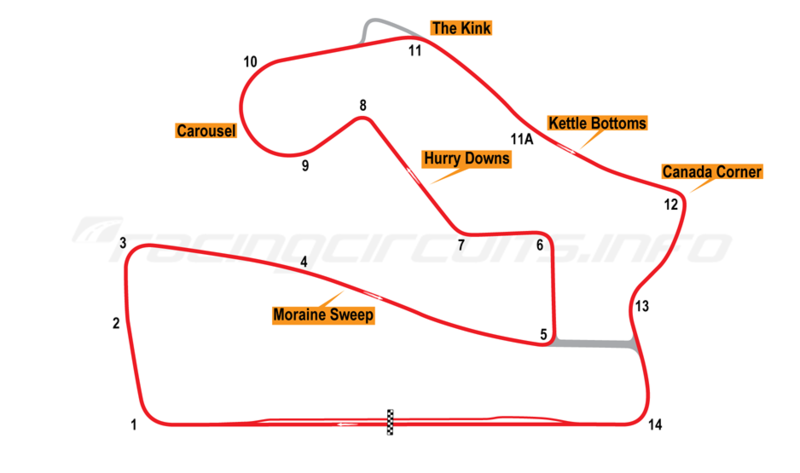 Since then, the track has hosted many major American motorsport's series, including the American Le Mans Series, CART, NASCAR and the United States Road Racing Championship. During this time the layout has hardly changed, apart from a chicane that was installed for AMA motorcycle competitors at The Kink. Hélio Castroneves secured his 50th pole position, as Team Penske locked out the front two rows of the grid, with Power second, Newgarden third, and Pagenaud fourth. The start saw Castroneves hold the lead, while Newgarden managed to get around Power for second and Dixon managed to get around Pagenaud. During the opening lap, Pigot suffered a broken front-wing, after making contact with Hunter-Reay. On lap 6, some drivers, including Rossi, Rahal and Aleshin began to pit for what would be a four-stop strategy, while he leaders, elected for a three-stop strategy, not pitting until around lap 13. After the first stops, Castroneves had a narrow lead over Newgarden, while Dixon and Rossi both leapfrogged Power to take third and fourth place, respectively. Soon eafter, Pagenaud overtook Power, dropping Power out of the top five. On lap 20, Newgarden was able to get passed Castroneves, pulling away and himself a solid lead. Castroneves soon began falling into the clutches of Dixon and Pagenaud, when the second round of stops for the leaders came at lap 27. During the stops, Newgarden maintained the lead, but now was ahead of Dixon in second. Almost immediately after the completion of the first round of stops came the race's first caution, as Takuma Sato spun, making contact with the wall at Turn 11 on lap 29, though was able to continue after getting a bump start from the safety team. During the caution, drivers on the four-stop strategy elected to pit. The restart saw Dixon swing around the outside of Newgarden through Turn 1 to take the lead, with Castroneves passing Newgarden a few turns later. The top five remained the same until the final round of stops on around lap 41. Dixon maintained his lead, while Newgarden successfully got around his teammate to put him back in second. Castroneves, Pagenaud, and Power completed the top five. On lap 45, the race saw its second caution, as Tony Kanaan crashed heavily at Turn 11, after breaking his front wing, in an attempt to pass Rossi. The restart came on Lap 48, with the front runners in the same order. Further back, Rossi, dealing with damage from the previous incident, was pushed off course and dropped down to 12th. Up front, no one was able to challenge Dixon for the remainder of the race, allowing him to secure his 41st career IndyCar victory and his first of the 2017 season. Newgarden came across the line in second, while Castroneves finished third. Pagenaud and Power finished fourth and fith respectively. Dixon's win allowed him to extend his lead in the championship, placing him 34 points ahead of Pagenaud. The driver with the most wins: 3. Mario Andretti: 1983, 1984, 1987. Emerson Fittipaldi, 1986, 1988, 1982. Michael Andretti: 1991, 1992, 1996. The team with the most wins: 10. Newman/Haas Racing: 1983, 1984, 1987, 1991, 1992, 1996, 1999, 2002, 2003, 2007. Dario Franchitti, August 19, 2000. 1:39.866, 145.924 mph (234.84 km/h). Team Kool Green, Reynard 2KI-Honda HRK. CART FedEx Championship Series. Helio Castroneves, 1:41.3007, 143.85 mph (231.52 km/h). Scott Dixon, Chip Ganassi Racing. Good post #1 as ever BJS, but you neglected to mention brats, the Beast and cheese. Looking forward to this 1!! Ooops. I found this article on the Nasportscar.com web site, appropriately titled: ''Wisconsin: the land of cheese, brats & race cars." Last edited by bjohnsonsmith; 20 Jun 2018 at 17:58. Ooops. I found this article on the Nasports.com web site, appropriately titled: ''Wisconsin: the land of cheese, brats & race cars." And BEER!! Erin forget to mention the beer!! Looking forward to this one, hopeful the new kit will continue it's good form. Great work as ever too BJS! Indy cars work really well at Road America, actually I guess everything does, since it is such an epic track. From Rahal's onboard, they're doing ~190 mph along all three straights, so top-end is certainly up, as we could expect from the reduced drag of the current package. We'll just have to see how the overall lap times bear out. why is espn showing tennis instead of the race as advertised? I think it's to do with whether it's on the HD version. I can't get a single feed. Edit: finally got one but it is bit delayed. Last edited by bjohnsonsmith; 24 Jun 2018 at 17:13. Mikes Hard Lemonde Fast Track Facts. That was a very clean start but Power was going backwards, lost about 10 places. If you're not a regular viewer, the IndyCar ticker at the top of the screen is absolutely worthless. Top 3 is 9, and the man has a face. 1. He also has a face. And 28. He has a face with less hair.